Bouncing on a Tom Dixon rubber band chair in the magical light of dusk, sipping on Bombay Sapphire cocktails in good company. There are worse things I could do on a Monday night. 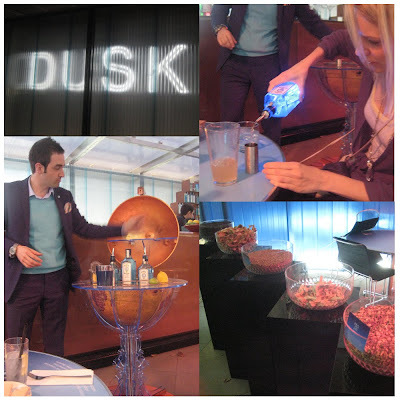 We, (a collection of London bloggers and Twitterers) gathered at the Dusk bar at Somerset House overlooking the Thames to learn all about the 10 botanicals which make Bombay Sapphire a "mixologist's" choice. The evening was held inside a perspex wonder designed by Tom Dixon with falling evening light, at one point the dusky sky was a truly gorgeous Bombay Sapphire blue, clever those marketing people huh? Under the tutelage of Sam Carter, buoyed along with delicious cocktails and nibbles, we constructed Martinis and Berry Spice cocktails. All the while learning about the brand's heritage and the world of gin at large. Information that would be very useful when we given a gin quiz later on in the evening. I tried to be gracious in victory, but all I can say is that the gin revealed my true competitive colours and my lust for academia was rewarded with a bottle of the blue stuff. We parted ways quite a while after dusk and as we walked off in search of a bus stop, clutching our spoils (a Gintelligensia goody bag including ANOTHER bottle of the blue stuff, cocktail shaker and gorgeous branded tools of the trade) I was very grateful to impulse, a new London friend/partner in crime and the amazing nights that can occur when you say 'yes'. My thanks to Miss Robinson, fellow bloggers and the delightful Bombay Sapphire team. Visit them while you can and indulge in an expert drink at the bar until October 18th. Dusk will become your favourite time of day too. Sit back, enjoy and start wishing you were an animator. What is the New Energy Future? Digit have been busy working on the latest installment of Shell.com with four great animations which are part of the work to illustrate the New Energy Future. Have a look, more to come. **UPDATE, here are all four animations, click on the four icons in the bottom right to navigate to the site. Or visit the new energy future to find out more.